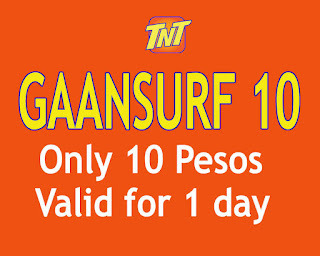 You can now maximize your 10 pesos load budget with Talk N Text GaanSurf 10 internet promo. It gives you open access data worth 50MB that you can use to browse any of your favorite websites using your mobile phone. You also have 100MB of exclusive data to access YouTube, Facebook and Mobile Legends all for one whole day. Since it only cost you Php10.00, you only have limited access to the internet that is why you need to minimize your data usage. You should wisely spend it to important matters like sending and receiving emails, responding to urgent messages, accessing within the day transaction and other so you will not run out of MB’s. You are required to reload your TNT prepaid account with 10 pesos before you can avail this offer. You can buy load credits at your nearest retailer and store. To register, just text GAANSURF10 then send to 4545. Check out the list of TNT Promo 10 for more budget package options. Upon successful registration, you will receive and SMS from TNT telling you that your Gaansurf 10 promo is already active and ready to use. For best browsing experience, better use LTE SIM card.